Just a few days remain to see the impressive survey of works by Magadalena Abakanowicz at Marlborough Gallery in New York. Marlborough’s exhibition includes 55 works created over a 21-year period from 1987 to 2009. Pieces from several of the artist’s various “cycles,” including War Games, Hoofed Mammal Heads, Coexistence and the Anatomy Cycle as well as three of the artist’s “crowd” figures, including Bambini, a group of 10 children, from 1998-99. Abakanowicz who is recognized as among the most original and powerful sculptors working today, initially gained international recognition for her remarkable, over-sized dimensional works of fiber. In Warsaw, in the late 50s and early 60s, Abakanowicz worked with what was available. “I could not pick up stone or marble and go to a foundry because there was no stone, no marble and no foundry to cast it,” she told Rita Reif of The New York Times in 2001, The Jackboot Has Lifted. Now the Crowds Crush. “This absence brought me to what they call the ‘world of fiber.’ It would never have happened if everyday life had been different. 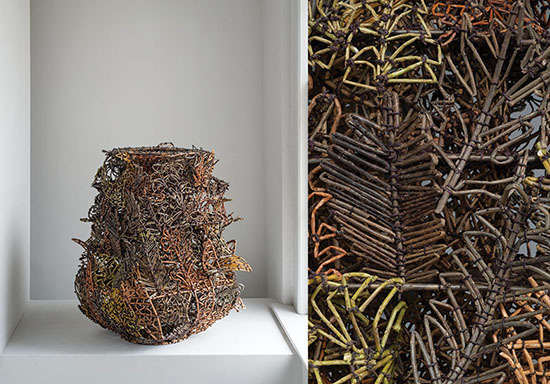 I needed to build something around me like a fence, to shut out the unpleasantness.” She called her early works, made of sisal ropes salvaged from the docks on the Vistula River in Warsaw “constructions” Abakanowicz has said that she had no desire to learn weave. 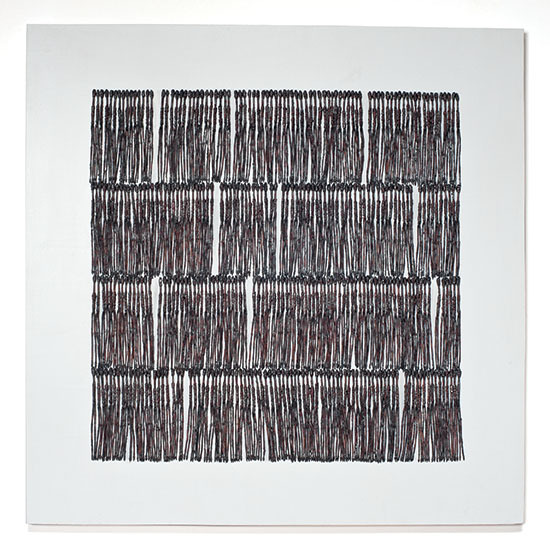 Nonetheless, one of her first woven works, Composition of white forms, created a sensation at the first international Biennial of Tapestry in Lausanne, Switzerland in 1962, not only because of the monumental scale — large enough to walk into, but because the work was such a departure from pictorial tapestry conventions. 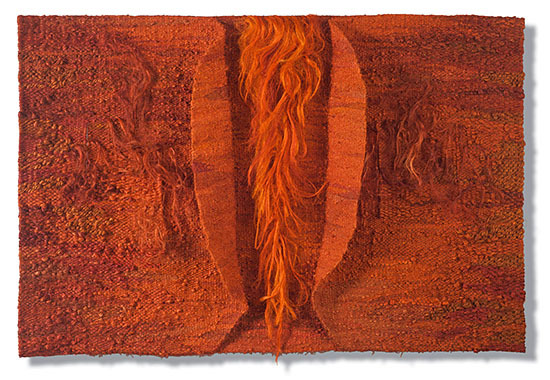 Though now far better known as a sculptor, Abakanowicz continued to create tapestry forms, albeit unconventional ones, through at least the mid-80s. Magdalena Abakanowicz: A Survey 1987-2009, Marlborough Gallery, 40 West 57th Street, New York, NY, 10019, 212-541-4900. To see a sampling of the exhibition, visit: http://marlboroughgallery.com/exhibitions/magdalena-abakanowicz-a-survey-1987-2009. Many of the artists promoted by browngrotta arts address nature and environmental concerns in their work. In honor of Earth Day, we present a series of images of works from Europe, Asia, the US and the UK. These include outdoor sculptures by Chris Drury and Ceca Georgieva, ethereal sculptures of jute by Naoko Serino and a complex new basket, A Panic of Leaves by John McQueen, made of sticks and strings. Window on Blood and Water is a temporary installation at Abbaye Jumieges, near Rouen in France created by Chris Drury for the region’s festival of Water. The work takes the shape and dimensions of the arch of the ruined church and fills it with a flow pattern of water and blood from the heart, drawing a link to the nearby river Seine and the Abbey’s violent history over the centuries. 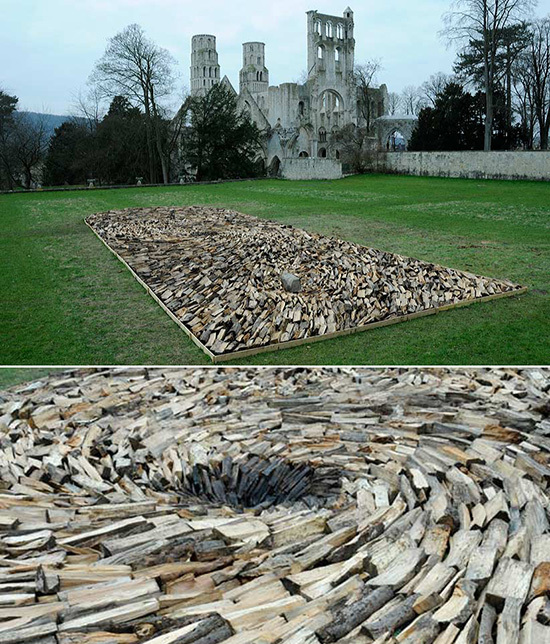 The work is 78.75 feet x 26.25 feet and is made from split logs and stones from the ruin. The exhibition of six works opens on May 14, 2013 and runs through the Summer/Autumn season. Works made entirely of jute are created by Naoko Serino of Japan. Moon Lee says that in Serino’s work,”the golden sheen and sinuous strands of jute yield a most spectacular softness and luminosity. The natural fibers are spun densely or pulled thin, making for infinite gradations of densities. 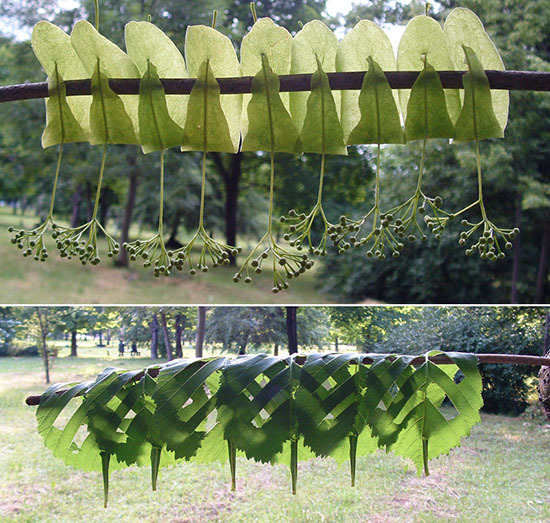 Irregular shapes in varying degrees of transparency provoke an effect that is strongly biological. Spheres, tubes, tubes contained within spheres, spheres contained within cubes, and rows of coiled strands evoke thoughts of phospholipid bilayers of cell membranes, veins, sea sponges, and so forth.” http://thecreatorsproject.vice.com/blog/naoko-serino-spins-vegetable-fiber-into-golden-sculptures. 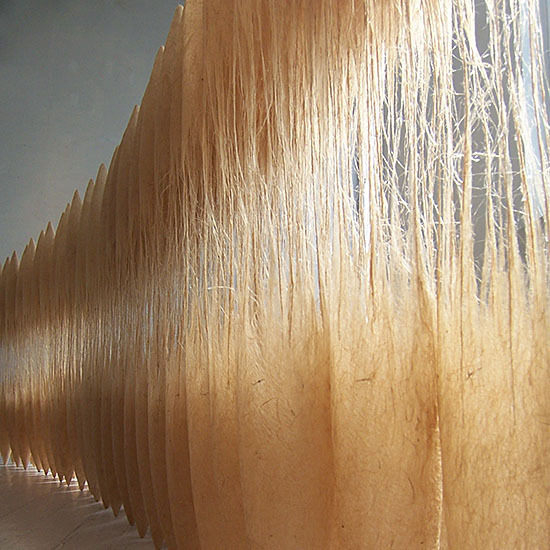 Today, Mary Giles will receive the 2013 Master of the Medium award for fiber from the James Renwick Alliance and the Smithsonian Museum of American Art in Washington, D.C. The Masters of the Medium award recognizes artists of consummate craftsmanship who have contributed to and influenced their chosen fields. The Masters of the Medium awards were initiated in 1997 on the occasion of the fifteenth anniversary of the James Renwick Alliance and the twenty-fifth anniversary of the Renwick Gallery. The Masters of the Medium Awards are given biennially in odd numbered years. Mary Giles resides in St. Croix, Minnesota. 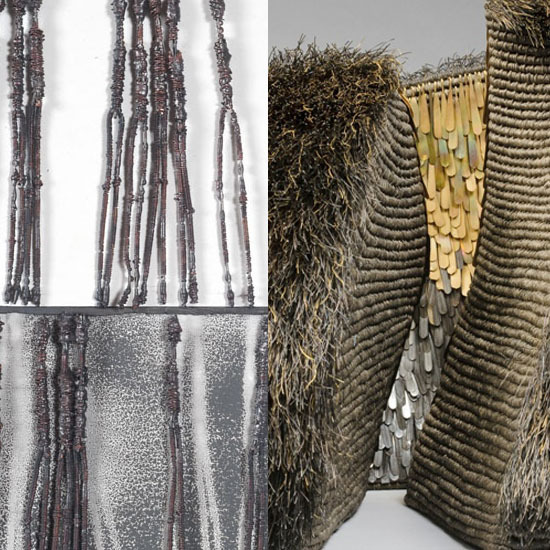 She creates mixed-media coiled baskets that are sculptural in nature, totems and three-dimensional wall works. Giles’ recently created a 53-inch “boulder,” The Long Divide, of hammered waxed linen, torched tin-coated copper and brass. 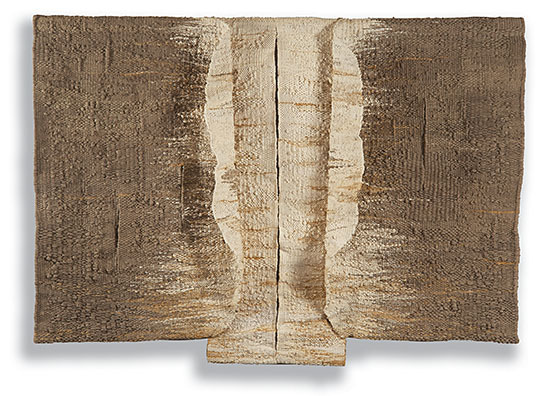 Her 2012 work,Twist, has been added to the American Decorative Arts collection of the Yale University Art Gallery, New Haven, Connecticut.